In a large bowl, mix together butter and both sugars until creamy. In a separate medium bowl, mash the peeled and pitted avocados with 2 tsp of the lemon juice. Add the mixture to the butter and sugar and stir. In a small bowl, combine milk with remaining lemon juice and let sit for 5 minutes. Add milk to butter/sugar/avocado mixture along with the beaten eggs and stir. In a separate bowl, mix together flour, salt, baking soda, baking powder, cinnamon, cloves and guar/xanthan gum. Add mixed ingredients to the batter and stir together to fully incorporate. Transfer batter to a greased 9 x 5-inch loaf pan. Bake until a toothpick inserted into the center comes out clean, about 50 minutes. If top of loaf begins to brown before the bread is fully baked, tent aluminum foil loosely over the bread. Cool in pan on a wire rack for about 10 minutes, then remove from pan and cool completely on wire rack. Bread tastes better after overnight refrigeration. I have to say it: I've never baked anything gluten-free before. (Gasp! I know.) 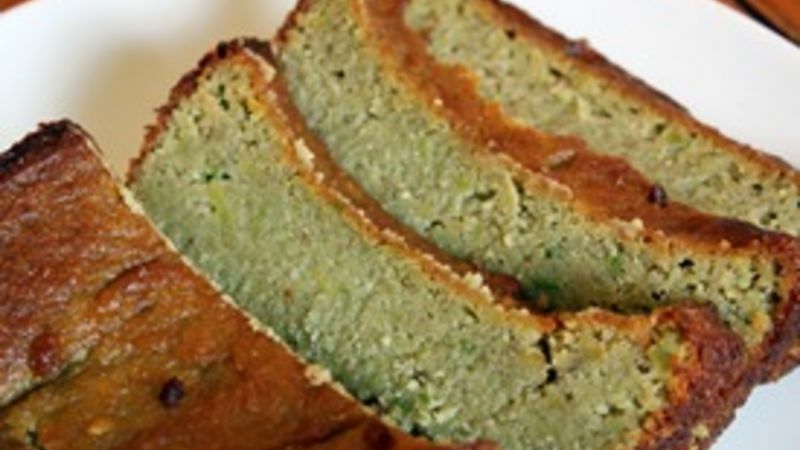 So when a reader asked for a gluten-free version of my Avocado Quick Bread, I was extremely hesitant to take on the challenge. I've heard things about gluten-free baked goods -- ones that crumble, ones that taste like cardboard, ones that look ugly or just don't taste the same as the regular version. Though I am not allergic to gluten (though I am allergic to many other things -- like bananas and kiwi and cantaloupe -- but that's a story for another day), it's only appropriate that I try to make a gluten-free bread one of these days. Thus, Gluten Free Avocado Quick Bread. I'll be completely honest about my adventure here -- I had no idea where to start with this gluten-free business. So, after asking a few friends and people I know who have celiac disease, I devised a plan to use almond meal/flour instead of regular bread flour, and to add guar gum (though xanthan gum apparently works well, too) to keep the bread from crumbling. I also was careful to use gluten-free baking powder, as some variations are not gluten-free. All other ingredients remained the same as the original. The batter was a little taller in the loaf pan than it was before, but I don't think that caused any problems. What did cause a rift in the plan was the fact that the top of the loaf began to brown way before the bread was fully baked. I had to tent aluminum foil over the loaf to keep it from burning around the edges. Also, while in the oven, the bread began to take on that lovely rounded top as it did in the original recipe -- but minutes after removing the loaf from the oven, it completely caved inward and looked kind of ugly. My final disgruntlement? I don't think I baked it for long enough. Though the integrity of the taste wasn't lost at all, the loaf was greasy and extremely moist, almost too much so -- but maybe that's just the nature of gluten-free quick breads. Still, the loaf tasted delicious and there wasn't even a hint of almond flavor from the almond flour. I'll have to keep monkeying around with gluten-free breads, but for my first experience I'd have to say, despite the gooier result (which I'll have to fix), it wasn't much of a challenge at all. And it certainly didn't taste like cardboard.